Luckyly! the elderly woman was alive and wounded only on her hand. 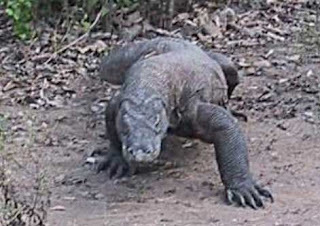 A 83-year-old Indonesian woman was attacked by Komodo Dragon near her home on Rinca, an Indonesian island, according to report by The Examiner site. The 83-year-old woman was indentified as Haisah. When the time that the she was attacked by Komodo Dragon, she was reportedly seated on the ground, building a broom from a coconut tree. Haisah's neighbors heard her screaming, so they went on the scene and chased away the Komodo Dragon. Komodo Dragon is one of the endangered animals. Their saliva contains bacteria that causes their prey to perish of blood poisoning within 24 hours of being bitten, according to Animals National Geographic. For the meantime, If you like this information, please bookmark it now or visit this site more often for you to be updated. You may also share this post to your friends so they may know about the 83-year-old woman attacked by Komodo Dragon. Comments or suggestions about "83-year-old Woman attacked by Komodo Dragon" is important to us, you may share it by using the comment box below.